In a CBS News investigation, as Breitbart Texas reported, researchers found that over the course of the last four years, foreign workers were brought to the states–either on the B-1 or L-1 visa–to fill construction jobs for the car manufacturing plant. The L-1 visa is for foreign workers who are employed by a multinational corporation. The workers are allowed to come to the U.S. after working with a corporation abroad for a year. Close to 80,000 foreigners are imported to take jobs that Americans would otherwise do. CBS researchers spoke with Gerald Greiner, a former manager for German contractor Eisenmann, revealing how foreign workers were imported to take construction jobs that blue-collar American workers could have done locally. In Greiner’s exchange with CBS News, he said “Oh yeah, absolutely. 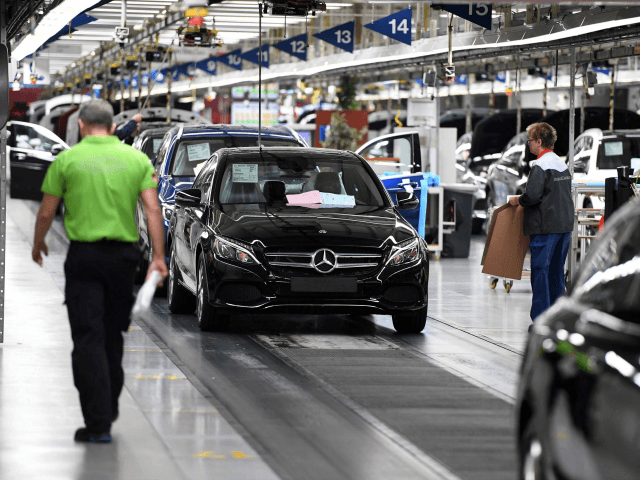 Yes,” American workers could have taken the construction jobs to build the Mercedes auto plant in Alabama, but were passed over. Since the investigation was released, Mercedes-Benz dropped Eisenmann as the contracting firm they use for construction jobs in Alabama. CBS News collected hundreds of videos and photos they posted on social media proudly showing off their American jobs, their work IDs, the money they were making, and the B1/B2 visas that got many of them into the United States. The visa costs less than $200 and allows foreigners to come and go for ten years. Visa holders are not allowed to work construction unless they are supervising a project which is not what appeared to be happening. Our investigation led us us to an apartment complex in Spartanburg, South Carolina where it appeared workers from Slovenia and Croatia were being housed by their employer nearby BMW’s largest manufacturing plant in the world, built with the help of more than $250 million in tax incentives and subsidies afforded to BMW since 1992. There are four pipelines for which multinational corporations use to import foreign workers. Those options include legal immigrants who come to the U.S. for work; non-immigrants who come to the U.S. on any of the employment-based visa programs available; foreign nationals who are allowed to work legally on Employment Authorization Documents (EAD) – like those given amnesty through the Deferred Action for Childhood Arrivals (DACA) program; and illegal aliens who enter the U.S. mostly through the southern border.